When CVSA was founded in 1993, it was thought that CVS was a condition of childhood and adolescence. Now we know that adults also suffer from CVS. There is CVS that begins in childhood and may extend into adulthood and adult onset CVS. As so many adults can attest, the condition causes untold suffering and disability, and often leads to family, school, and career upheaval. With children’s guidelines already in place thanks to CVSA fundraising and our strong medical team, we are embarking on a partnership project that will help adult sufferers around the world. Partnering with the the American Neurogastroenterology and Motility Society (ANMS), a strong medical committee will be formed to develop guidelines for the diagnosis and treatment of CVS in adults. When completed, these guidelines will help doctors and ER personnel around the world understand how to better care for CVS patients. Creating medical guidelines is expensive, and that’s where you come in. CVSA is the financial sponsor for this project, but we are asking you to help us fund the project. Any amount will help! 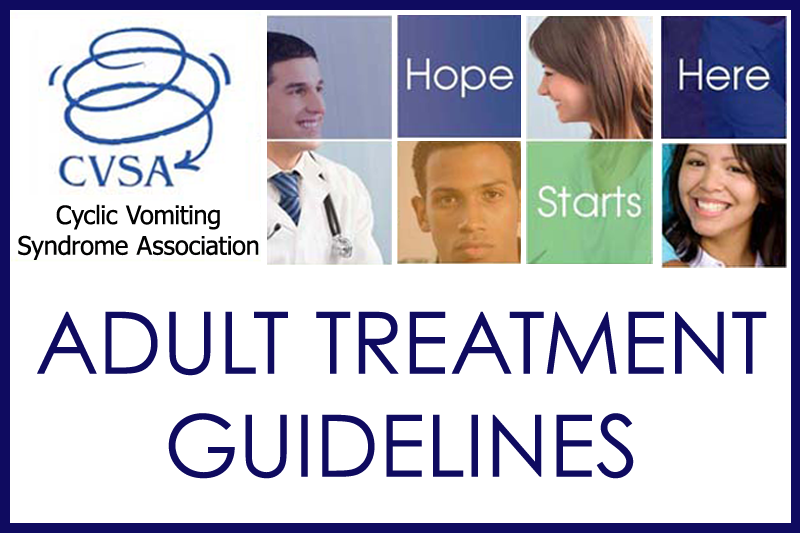 Between this very successful campaign, and other fundraising activities of the CVSA, we have met our goal and we are prepared to fund the creation of Adult Treatment Guidelines. That's why we have turned of donations here. For more on CVS, please goto our web site cvsaonline.org. I began getting sick in 2012 . My cycles start every 37 to 40 days. I have nausea, headaches, fever and chills. It will last 2 to 3 days ang then I'm back to my normal self. I have been to many doctors and the emergency room many times. No one seems to know or have ever heard of CVS. I am seeing my family doctor again this week to see about starting me on Keppra thanks to Ana and her comments and information about this drug. I pray this will keep these cycles from coming again. God bless all of the sufferers from this terrible sickness and I pray you will get answers too. At last. Someone who believes me!